So I am excited! I am actually planning Halloween a little early this year, meaning I will get to do all the fun stuff I have been thinking of this year. Starting a Boo! Gram in my neighborhood is one I have wanted to do for the past few years. The first time I ever saw this, was when we lived in Washington. I thought it was a great way to bring together a neighborhood. That being said, I decided to start one in our neighborhood this year. Hey maybe you will want to start one in yours as well. There are some variations on how people do it, but the basics are the same. Put together a goodie-basket of Halloween treats for a neighbor and then they do the same for another neighbor. Oh and What is a Boo-Gram? Well let me tell you. 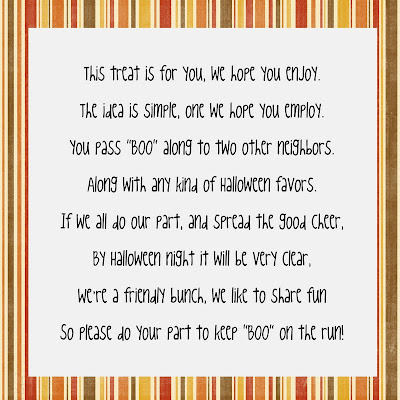 A Boo-Gram is a mysterious note you leave on a neighbor door, usually with some kind of treat for the kids in the family, or for everyone. The note is usually a poem. You also leave a large Boo! sign with the note and bucket/basket. Some people use a ghost or other decoration to designate the Boo. The sign or decoration tells other neighbors that this house has already been hit. If people participate, by Halloween you'll see Boo's lining up and down the street on all the doors in the neighborhood! You choose whatever you want to give for treats. They usually vary from small candy to small kid's toys, to hand towels and magazines for Mom. To keep the chain going, when you get Boo'd, you need to Boo one or two other neighbors. Half the fun is ringing the doorbell and running away! 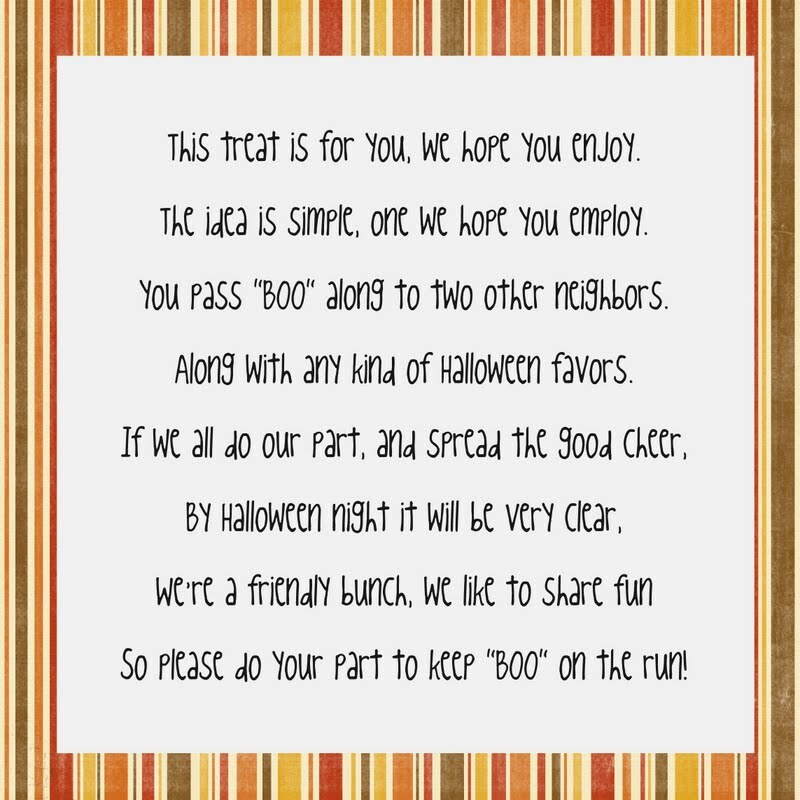 Kids love to get in on this and it's even more fun when they choose which neighbors to Boo and pick out some of the treats. So now let me tell you which poem we are going to use. This treat is for you, we hope you enjoy. The idea is simple, one we hope you employ. 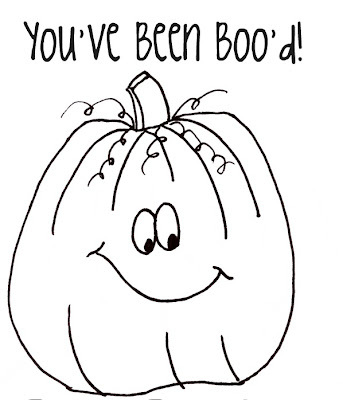 You pass "BOO" along to two other neighbors. Along with any kind of Halloween favors. More poems can be found here. Now that you know that What and the How here is a simple run down of what you do. How to Start a Boo! 4. Deliver, ring doorbell and RUN! We are starting this the first week of October. I hope that all our neighbors participate and all join in on the fun. Here is a copy of the sign we will be giving them. 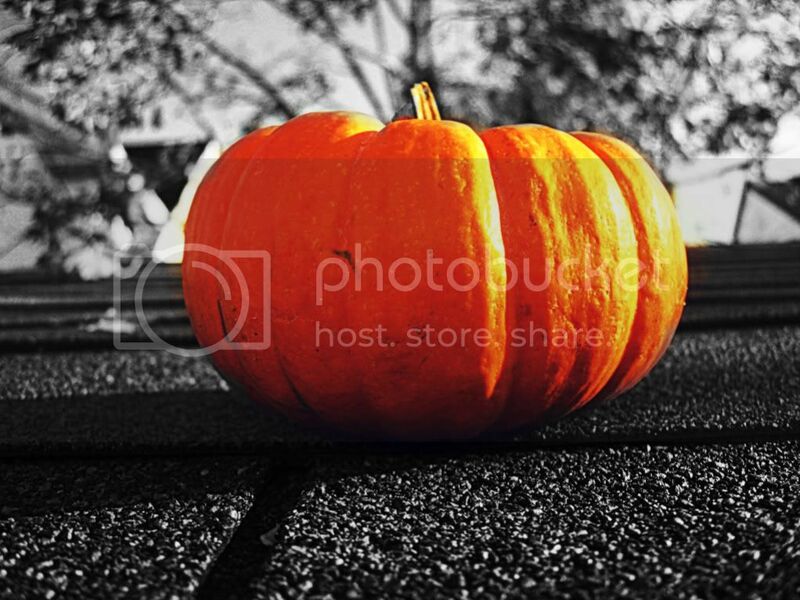 You need to get started by the middle of October so get going! and come back here and tell me how it goes. If you do it, take pictures and then we can post them here. 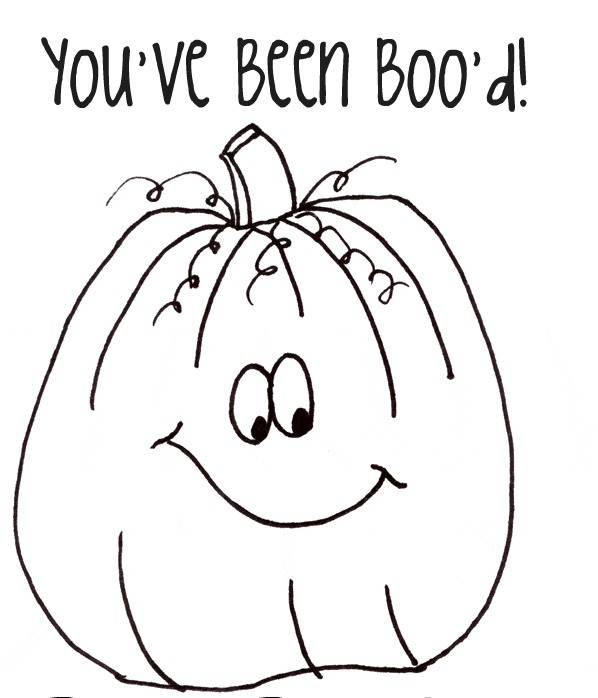 Lets get everyone spreading the BOO around this holiday season! Come back tomorrow for a fun craft tutorial by yours truly and a run down of everything to expect this month. Man our guest bloggers are going to be AMAZING! I am so excited, but I think I've mentioned it before. We did this last night! We did it as the "* Ward" ghost and are hoping it gets passed around to everyone in the ward! SO fun! I love your poem! What's up, I desire to subscribe for this weblog to obtain most up-to-date updates, thus where can i do it please help.